Carter: "The best thing we can do is engage them and stop making...threats"
ATLANTA, Georgia (CNN) -- The United States and other nations should take a diplomatic approach toward Iran in negotiations over that nation's nuclear program, President Carter said Thursday. 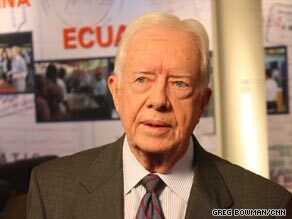 President Carter says the U.S. should take a diplomatic approach toward Iran. Iran's nuclear chief and representatives from the five permanent members of the United Nations Security Council, as well as Germany, started talks Thursday in Switzerland over a recently revealed nuclear facility in Iran. Tehran says it is developing its nuclear program for energy purposes, but many nations think Iran wants to make nuclear weapons and will be able to do so in the near future. The existence of the second uranium enrichment facility prompted President Obama and the leaders of Britain and France to publicly chide the Islamic republic and threaten further sanctions last week at the G-20 summit in Pittsburgh, Pennsylvania. A deliberate approach will work best with Tehran, Carter said. "I hope and pray that Iran will be induced to permit international inspectors to come in and observe their entire nuclear program, because what they're doing so far is completely legal under the nonproliferation treaty," Carter said in an interview with CNN's Candy Crowley. "They have a right to purify uranium and plutonium to use for nuclear power," Carter said. "If Iran is on the borderline, the constant threats that we or the Israelis are going to attack Iran is the best thing to force them to say, 'Let's defend ourselves.' I don't think Iran has made up their mind what to do, and I think the best thing we can do is engage them and stop making these idle threats." Iran said Tuesday it will allow inspectors from the International Atomic Energy Agency to inspect the new facility, but it did not offer a timetable for the visits. Carter's comments came on his 85th birthday and on the day the Jimmy Carter Presidential Museum in Atlanta, Georgia, reopened after a $10 million redesign. The museum, which opened in 1986, was closed for five months for the renovation. Carter also commented Thursday on remarks he made in mid-September, when he said he thought much of the extreme animosity toward Obama was caused by racism. In an interview with NBC's Brian Williams last month, Carter said, "I think an overwhelming portion of the intensely demonstrated animosity toward President Barack Obama is based on the fact that he's a black man, he's African American." Carter went on to add that racism "has bubbled up to the surface because of a belief among many white people -- not just in the South, but around the country -- that African Americans are not qualified to lead this country." Obama said afterward he did not believe racism is behind most of the attacks on him. On Thursday, Carter said he was only speaking about a "fringe element." "I said those that had a personal attack on President Obama as a person, that was tinged with racism," Carter said. "But I recognize that people that disagree with him on health care or the environment, that the vast majority of those are not tinged with racism." Carter, who was president from 1977-1981, said the renovated museum is "a continuum of what you do before, during and after a presidency." He noted that many of the problems he dealt with while in office still exist today. "I've identified about 30 things of importance that I had to address when I was president that are still on the desk of the Oval Office and President Obama has to address, notably the Mideast and Iran and energy and a comprehensive health plan and many, many others," he said.